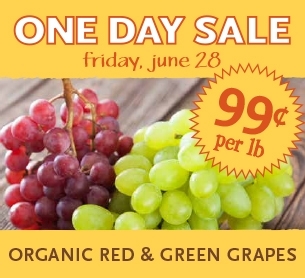 This Friday, June 28th, Whole Foods Market is having a One-Day Only Sale on Organic Grapes for only $.99/lb. This is a GREAT price for organic grapes! These are perfect as frozen summer snacks or to add natural sweetness to smoothies. Remember, you don’t have to use all your grapes at once. I usually will stock up and flash-freeze them to use all year long. If you’ve never tried flash-freezing, check out my easy step-by-step tutorial on How to Flash Freeze HERE. “Any Fruit” Smoothie *Perfect for a hot summer day! Sonoma Chicken Salad *I haven’t tried this recipe, but it looks Dee-lish! Want more recipes? Check out my Recipe Box for even more recipes.